Choosing Outfits – Being comfortable, expressing yourself, accessorizing, adding layers, playing with texture and pattern, adding variety, and planning ahead. Hair and Makeup – Hiring a professional, nails, and on-site touch ups. Extras – Props, locations, important people, and pets. One of the questions I get asked the most, is “what should I wear to my senior shoot?” This is an awesome question because what you wear is SUCH an important aspect of your session. It can make or break your seniors, which might sound exaggerated, but it’s true! If you accidentally wear something that is unflattering on camera or something you don’t feel good in, it could affect how much you like your pictures. Along with my Pinterest senior styling inspiration board, here are some tips I have learned throughout the years to help guide you through your wardrobe choices. My number one recommendation is to wear something you KNOW you look good in. This might seem obvious, but for me at least, there have been so many times where I have envisioned something looking a certain way, only to realize it just doesn’t work for me! If you aren’t 100% confident or think that you’ll be constantly adjusting your outfit and questioning whether you look good, leave the item at home! Being uncomfortable will SHOW in your pictures and make you uneasy throughout the shoot, trust me. Katie looked awesome in this outfit she put together! I feel so passionately about this! Seniors who express themselves are my favorite to photograph!! Their shoots have the “wow” factor and set them apart. Let your outfits express who you are, what you like, and your personality. If you love vintage clothes, incorporate something vintage! If you like cats, wear a cat shirt as one of your outfits! Add some humour into your photos if you want! If you are interested in high fashion, wear something high fashion during your shoot! Don’t be afraid to be BOLD and wear something you wouldn’t normally wear in day-to-day life or at school. Sometimes outfits that might look kind of weird or bold in normal life photograph really well. Your senior shoot is all about capturing who and where you are in life at this moment – so wear something that goes along with that. This will lead to the best and most personal photos. Sometimes some of my seniors will be a little hesitant to break the norms and bring something a little out of the ordinary, but from my experience, these pictures become a few of their favorites and are the most fun to shoot in. This was probably one of my most favvvorrite outfits to ever photograph. Sara LOVES cats, so she brought all of her gear over, and we couldn’t stop laughing the entire time we took these!! After the shoot, Sara literally told me she was the most excited for the cat photos. Since Sara also dances, she brought a few dance outfits to make her senior shoot more special and personal! Charlie looovess working out and does Insanity and P90X, so she brought some workout clothes and we got a few really cool shots!! Paris was the absolute queeeenn of making her shoot personal and expressing herself. She didn’t want her shoot to be all smiles, because that wasn’t a realistic depiction of her journey up to this point. Since she loves vintage, she included a piece from her grandma’s closet that she had modified. Morocco also holds a special place in Paris’ heart, so she brought a djellaba for a few photos as well. Paris is strongly drawn to urban looks, so halfway through her shoot we completely switched vibes into a more edgy outfit and setting. Millie is really into fashion, and wanted to do a more urban styled shoot, so she didn’t wear what could be considered as a “typical” outfit, and instead went with something that fit her personality. Shelby was also really into fashion and brought a variety of bold outfits to showcase this!! I LOVE when seniors mix some school spirit into their shoots! Jenny was planning to attend (and is now attending!!) the Naval Academy, so she brought a shirt associated with her future school coupled with some cute earrings. Bright colors photograph super well, so wear items that POP and complement your hair and skin tone. Colors like red, royal blue, yellow, emerald greens, bright purples, pinks, and really anything else that pops will look good. Color combos that might seem weird or too much in person sometimes photograph really well too! Swathi, Emma, Tory, and Kacey did a great job at this! Accessories are SO important. They really complete your look and can be the aspect that gives your shoot a “wow” factor. Adding things like dangle earrings, long necklaces, statement necklaces, bracelets, rings, floppy hats, flower crowns, headbands, and scarves make ALL the difference. In the colder months, cute hats, scarves, and gloves look awesome!! Also, don’t be afraid to over accessorize! You can always take things off, and it’s better to have more, than not enough. Don’t forget about shoes! They really bring your whole outfit together, so think carefully about what you’re wearing on your feet. Millie and Katie wore such cool shoes that completely POPPED and pulled their outfits together. It made SUCH a difference in the look of her photos! Amy matched her outfit perfectly with those tall, brown boots and long grey socks! SOCKS. They can totally make a difference in your photos as well. Her outfit just looks way more put together because of them! Ed‘s socks were a super fun touch too. Jewelery is a really great way to accessorize and give your outfit that complete look. Here are some great examples of seniors that implemented necklaces, rings, bracelets, earrings, hats, scarves, bows, flower crowns, and more! You certainly don’t have to do it all, but try adding a few here and there, and it will make the difference when you see your photos!! Adding layers looks amazing in portraits! Wearing cardigans, sweaters, vests, jackets, overlaid shirts, and more makes your photos so much more fun and interesting. Additionally it gives you more posing options and some place to put your HANDS (the never-ending problem)! For example, if you wear a sweater or jacket over a shirt, you can put you hands on the zipper part of your jacket, or in the pockets, which are two whole new poses that you wouldn’t have otherwise! Adding layers also means that you can REMOVE layers to create even more looks. Kayla, Amy, and Shelby all picked super cute jackets and cardigans to create more variety in their shoots! Adding texture creates dimension and makes your photos much more interesting. Things like fur, sequins, knit sweaters, wool, and leather photograph SO well! Some of these might seem “daring,” but they look really good in photos. And that myth stating how you should ONLY stick with solid colors is so wrong!! Patterns look reeeallly really good, so feel free to play around with that! I recommend choosing anywhere from 2-4 of these categories and find outfits accordingly. This creates a beautiful array of looks that are completely different! This is just what I provide as a guide, but you can wear anything you want! Some of my seniors have wanted all urban looks, and they always turn out AMAZINNGG – so it really just depends on who you are and what you’re going for. Planning your outfits ahead alleviates stress and gives you the reassurance that you are going to look your BEST. Also, if you end up needing to make last-minute changes, you can! Go shopping and get your outfits together a week or two ahead of time so you don’t feel rushed as your session draws closer. I’ve had a few seniors wait until the day of or night before, and they end up going into their shoot stressed, tired, and sometimes insecure that they don’t look their best…which is not what you want!! If you can avoid this, then why not?! Just like when you hire a professional photographer, you trust him/her to make you look your absolute best! It’s the same with HMU artists – they are TRAINED to know what looks good on camera. Your makeup might look amazing in person, but it will look completely different in photos! Professionals will enhance your best features, and will make you love your photos much more! Even if you don’t wear makeup, you can still get very natural looking makeovers!! 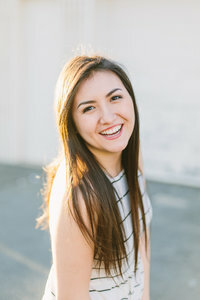 Prepping for your senior shoot can be stressful enough as you try to choose the best outfits and shake off the nerves of being in front of the camera soon. Getting your hair and makeup professionally done gives you less to worry about! Additionally, professional cameras are made to capture every detail on your face, which is all the more reason to go with a HMU artist. Getting your hair and makeup done professionally will relieve any uneasiness you have and make you feel confident about how you look! This confidence will SHOW in your pictures, and enhance your overall experience! Arriving at the shoot stressed will definitely affect your photos and experience, but if you come feeling good, pampered, and taken care of, your photos AND your senior shoot experience will be much better! ** If hair and makeup isn’t in the budget, that’s totally ok too! If this is the case, I recommend putting on makeup a little heavier than normal, including blush and lipstick/gloss that is at least slightly darker than your lip color. Lip color makes a HUGE difference in your photos. You can still look natural while adding lip color if you’re worried about that! I also highly recommend false eyelashes. These small details make a BIG difference. 2. Don’t Forget the Nails! Painting your nails can often be forgotten in the bustle of getting ready for your seniors, but make sure you don’t neglect them! During the shoot, there will be a lot of poses with your hands in the frame, so make sure they look how you want! I recommend avoiding any chipped polish or crazy patterns. Keep them light and natural! French manicures, soft colors, or even colorless nails photograph the best! Be sure to bring a hair brush, extra makeup, and a small mirror to the shoot for touch ups! We’ll be moving around a lot, and you want to have touch ups on hand just in case! It’s better to be prepared than not at all! Morgan brought extra makeup and changed her lipstick halfway through! It added variety to her seniors and looked amazing!! I LOVE when my seniors bring props. They make your session SO much more fun, personal, and meaningful to you! If there is something you love, whether it be singing, a sport, certain foods, reading, art, a tv show, or something else, we can use props to incorporate it! If you love Starbucks, bring a Starbucks cup! If you love dancing, bring a dance outfit! If you love playing the trumpet, bring your trumpet 🙂 If you love reading, bring some of your favorite books! If you love singing, bring a microphone stand and/or sheet music! Do you collect something? If so, bring those. The possibilities are endless. If you want to incorporate something, but don’t know how, I have TONS of ideas, so just let me know, and we’ll find a tasteful way to add it in! I also refer all of my seniors to my Pinterest prop inspiration board with ideas on how to make your shoot more personal and meaningful. French culture, cooking, food, art, music, playing the guitar, California, college, reading, running, and cotton candy were some of these seniors’ favorite things or upcoming seasons of life, so they brought along props to make their shoot more personal and reflect that! Don’t be afraid to get creative!! Emma‘s session incorporated smoke bombs, and it was siiiick. I literally jump with joy when seniors have ideas and are down to get creative. The weather called for rain before Sophie’s shoot, so she brought this cute umbrella! If it rains, you don’t HAVE to reschedule your session, as it can still turn out beautiful. I have a similar, transparent umbrella that photographs really well for any seniors who are doing their seniors in the rain! In the questionnaire I send to all of my seniors, I ask what kind of setting they want to take their photos in, and give them these categories as a guide: urban, rural, farm, or nature. However, if time permits, I sometimes like going to multiple locations if they are reasonably close to each other! This helps create a variety of looks. There are also a lot of locations that incorporate more than one of these categories. For example, in DC there are so many places where you can get a city, urban, and naturey look! Locations are also another awesome way to make your senior shoot more personal and meaningful. I have a bunch of ideas of course, but always get so excited when seniors come up with their own!! For example, is there a favorite restaurant or coffee shop you go to often? If so, we can try to go there. Do you like performing on stage? We can try to find some abandoned stage to go to! I’m up for anything. The more creative the better!!! Since Breny loves hiking and being outdoors, we decided to do her shoot in the mountains!! The drive was so worth it. Katie wanted to go to her mountain house to make for a more meaningful senior shoot, while Paris was into something more urban, and Casey was dying to do part of her session at an evening fair! Jocelyn lovvvess art museum, so we took portraits of her at her favorite in DC! Shelby‘s shoot was so eclectic!! For one location we went to the Hirshhorn Museum in DC and shot at various exhibits – so cool. And if you want to do your shoot all over Europe…I’m totally okay with that too!!! Haha kidding (but actually lezgo). When I traveled to various countries in Europe this past summer with Mona, we did her seniors there! In all seriousness though, if you want to travel, I am so down!! I allow my seniors to bring 1 other person to their shoot for the first or last 30 minutes! This can be a family member, boyfriend/girlfriend, best friend, etc! Stephannie brought her boyfriend to her seniors, and Katie brought her sis! So cute. A lot of seniors ask me if they can bring their pets to their shoot…and the answer is YES! Whether it is your pup, cat, etc, we can totally incorporate him/her into your session! I don’t recommend shooting the entire session with them, but spending a few minutes with them is a great idea! Sarah loves her dogs and asked if we could grab a few pictures with them at the beginning of her shoot! This was so helpful Angelika! Thank you! !